It's a big day for Sen. Tammy Duckworth, who has given birth to a baby girl and made history doing so. The decorated Iraq War veteran who lost both legs when her helicopter was shot down had her second daughter Maile Pearl Bowlsbey Monday, she announced, making her the first U.S. senator to give birth while in office. Both Duckworth and her family are "recovering well," her office said in a statement. The newborn girl is Duckworth's second child. Duckworth, who turned 50 in March, says she appreciates the historic nature of her baby's birth, as well as the fact that she represents working mothers and women having babies later in life. She fully expects to have to find a place to nurse in some quiet parlor off the Senate floor. 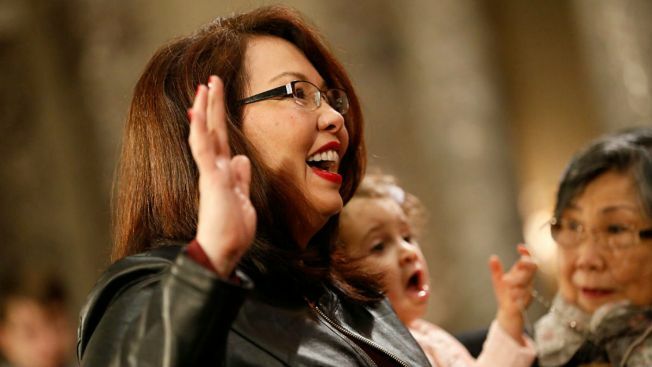 Duckworth, one of 22 women in the Senate, is already in the history books. She's the first female amputee elected to Congress, the first Asian-American to represent Illinois in Washington and the first member of Congress born in Thailand.